Last update on Mt Adams, I had been busy with paper mache. Since then the whole lot has had a good coat of browny paint from our top secret strategic stockpile of test pots. 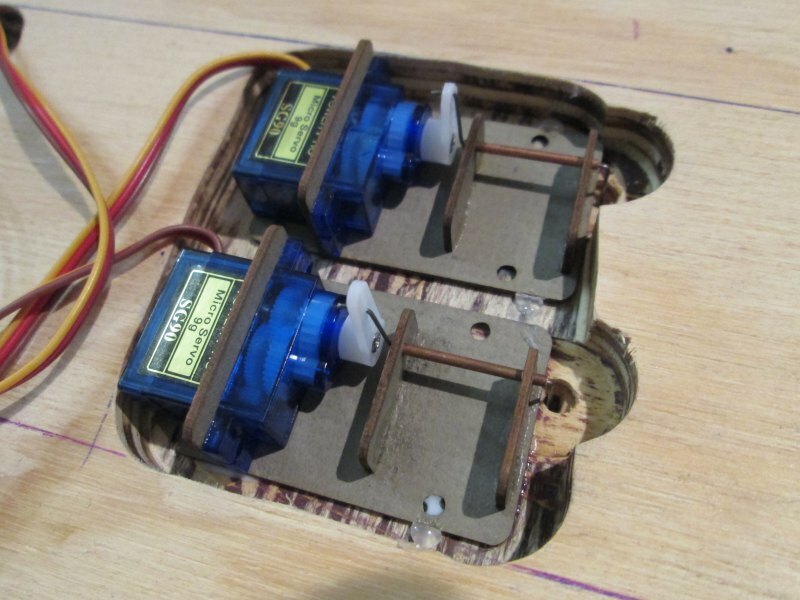 The double crossover has been mounted and I've designed some laser-cut servo-based point motor mechanisms that are recessed into the plywood base (so they don't foul the polystyrene scenery base). 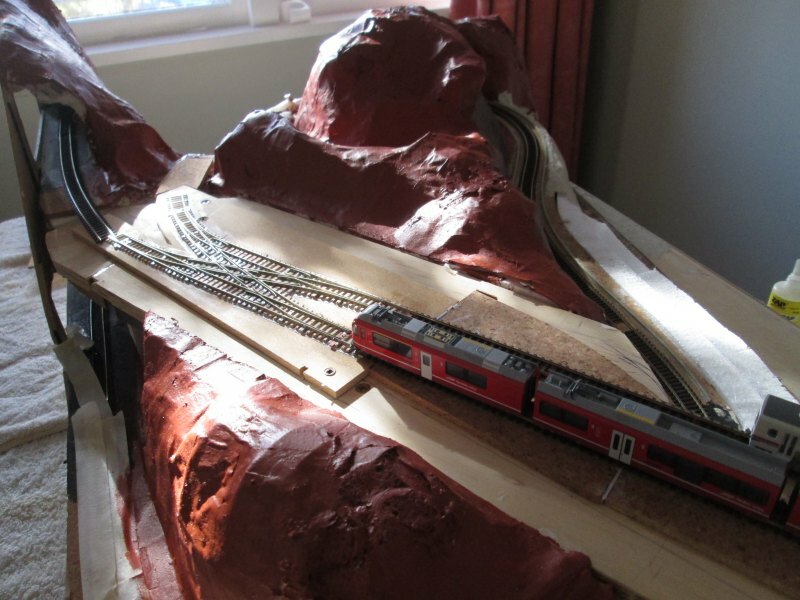 The upper station has had its track laid, as has the upper tunnel. Yesterday I finished placing all the remaining track. Step one to running trains completed! Today's job was to wire everything up. Quite a job. I have 6 points, all of which need servos. 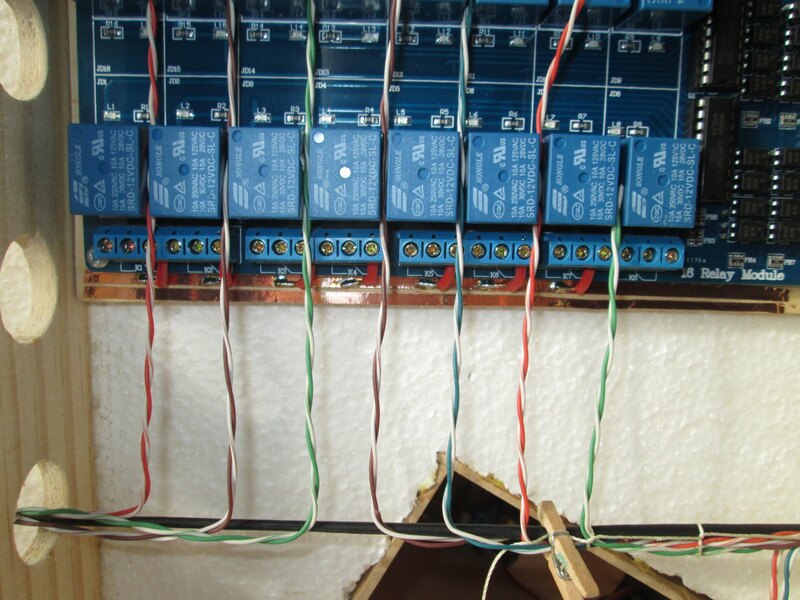 They also need a relay each to control the frog polarity. Then there are 6 isolating sections, plus the main line to wire up for block control (this is going to be a mixed DC/DCC railway). 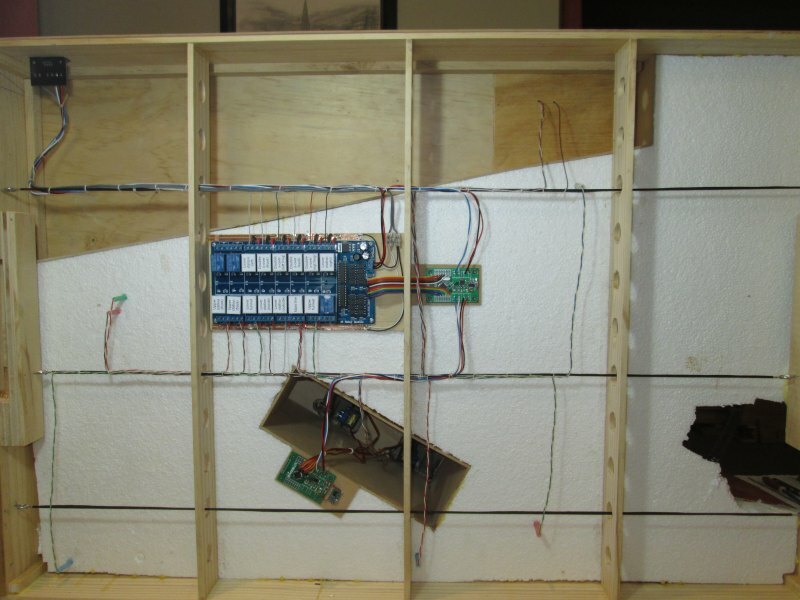 Plus I need wiring for the "UBus" to control all the relays and servos, and in future signals, lights, and train detectors. So, a lot of wires. For the catenary wires I used old 300 ohm TV antenna leads from the attic, stripped into single wires. They are nice and chunky and black, and I have a lot of it. For the lacing string, I used the stitching from the tops of our chicken feed sacks. Around each hole through the polystyrene, I made standoffs out of discarded "RibbonNet" fibre tubing, which is just really stiff 1/4 inch diameter plastic tubing in four fetching pastel shades. I nabbed a bit out of the gutter one night when our street was being "fibred" as a keepsake and it has come in quite handy. As I went along lacing the wire bundles, I used little micro-pegs to keep the string taut, and the wires in place. Every so often I would add a dab of superglue to the thread to lock it in place. 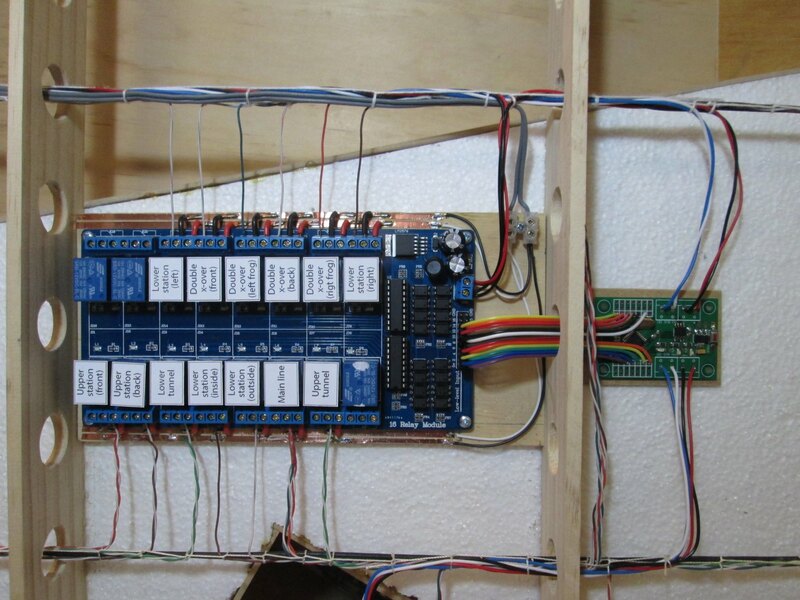 The central wiring block is a large 16 relay controller board. Along the top and bottom I have strips of self adhesive copper foil to carry the inner and outer track wires. Short lengths of red & black household mains wire (recycled from renovations) act as jumpers between the track bus bars and the relay module. The twisted cables running to each point and track block are my old favourite, computer networking cable, left over from when I wired the house. It is all colour coded and twisted in pairs, which makes wiring very tidy. All that took a pretty good chunk of the day. Tonight I sat down with a multimeter and debugged all the short circuits. Next time I ought to draw the track wiring diagram before I wire the track! So that was this weekends achievements. 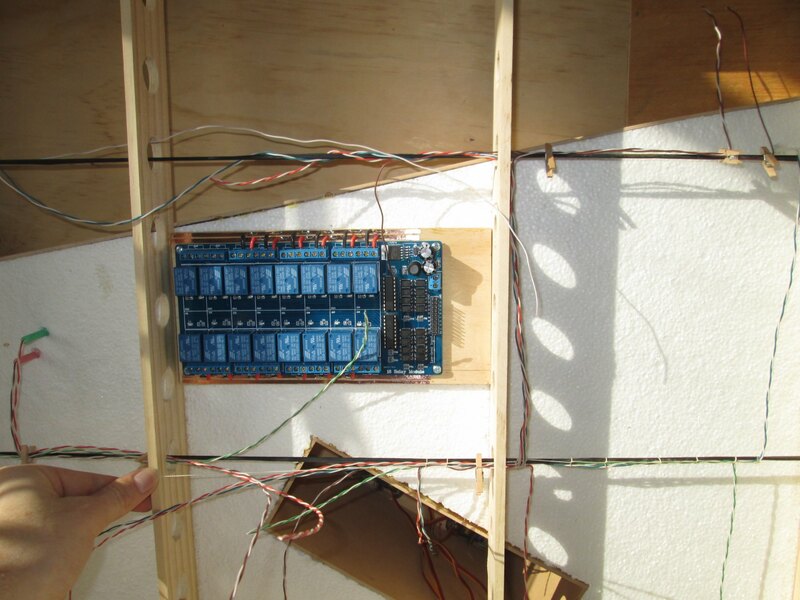 I am pretty pleased with how neat the wiring is, and hopefully this week I'll be able to run some trains? I admire your wiring job - mine are always a horror show. Question: In the second photo - the one with the train in the lower right - what's the prototype and who manufactures the model? From that top view it looks like the trains that run on the light rail system here in Ottawa. Hi JD, this is a Kato model of a RHB Allegra EMU. The Allegra has a squarer front, but the colour scheme is a dead ringer for the O-train. Thanks for getting back to me Michael. Yeah, it was the colour scheme that set off my O-train radar. What's that relay module? It looks interesting!